This is how it was told to me. Can’t say I’ve seen anything like this myself. 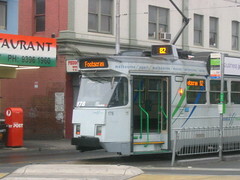 The tram was departing Footscray from the terminus, close to the market. A passenger got on board, with two live chickens from the market. “Oh. Okay”, replied the passenger. And, apparently eager to comply, he broke their necks. The tram driver decided at that point that he’d just drive the tram. Nathan, rules for animals on PT are in chapter 8 of the Fares and Ticketing Manual. Technically, small animals can be carried if they are in a “suitable container”. Are chickens “small”? Dunno. smart cookie – i can relate to that. The 82 attracts a fairly eccentric crowd compared to most tram routes. It’s also the only route that is not patrolled by Authorised Officers – apparently they refuse to go there. Doesn’t sound unbelievable for the route/area, but why would anywhere be selling *live* chooks in the Footscray Market? Only in Footscray… Oh, and the 57 tram is a hoot too. Chickens and other animals are indeed for sale sometimes at QVM. Daniel… they still even sell DUCKS (I know because I go looking for the ducklings) at the Vic Market. Everything that is old is new again…. My father use to tell me this story however it was set in the late 60’s, it was at the Queen Victoria Market and it was a conductor who tells an old Italian woman that she cant bring chickens onto the West Coburg tram.